Parents often wonder when they should start taking their little one to the dentist. Professional exams and cleanings are an important aspect of keeping teeth healthy, and healthy teeth are an important aspect of speech and oral development. So you definitely want to bring your child to one of Ridgeview Family Dental’s friendly offices for routine care. However, a lot of what happens during early childhood dental visits is demonstration and education on how to protect teeth in between checkups. The baby bottle has been around longer than most of us can remember. It is a necessity for any new parent, one that an infant relies on to lull them to sleep. 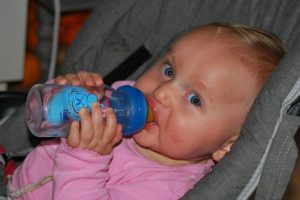 As innocent as it seems to give your little one a bottle of milk or juice at bedtime, or even naptime, this habit has been associated with caries, or childhood decay. It isn’t that you cannot give a bottle to your child to help them fall asleep. However, that bottle should have no sugar or sweetened beverage. Water is best. Children can begin learning the value of oral care early in life. As soon as baby teeth can be seen, they can be brushed. Even before this time, however, it is important to clean an infant’s mouth with a moist, soft cloth or “finger brush.” A bedtime routine for parents can include young children before they are able to brush independently (HINT: that isn’t until about 8 years of age! ), enabling youngsters to learn by watching. At some point, most kids want to mimic Mom or Dad, and will make strides toward implementing their own oral care habits. Water seems to be the least liked beverage of them all. Poor water! The thing is, water is necessary for a healthy body and for healthy teeth. Children can learn to love this beverage with a little effort. Instead of offering up plain water, consider adding lemons and cucumber, or a few mint leaves into a large container from which children can sip throughout the day. Cavities and infections in the mouth are no fun, no matter how old you are! Avoid these problems by seeing your dentist regularly. We are happy to see you in our Warrensburg, Windsor, or Oak Grove office.